Born in Saitama Prefecture, Kisaka Ryo lives in Tokyo. When she graduated from university, she self-published her first book in 1981. Her second book Slickly Slippery (Tsu-tsu-tto) was awarded the Hanatsubaki Contemporary Poetry Prize. 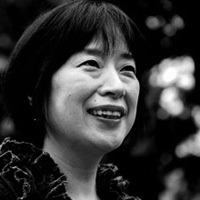 She also won a prize for her collection The Golden Net (Kin’iro-no-ami) in 1996. She continues writing poems and publishing poetry, essays, and children’s stories, and translates picture books into Japanese. Her most recent translation is The Taste of a Rattlesnake: Children’s Verse in America, published by Iwanami Shoten in 2010. Translator Arthur Binard, husband of Kisako Ryo, is a poet, haiku poet, essayist, translator, versatile writer, who writes poetry in Japanese. This is a happy instance of a collaborative pair, both poets, nourishing one another.